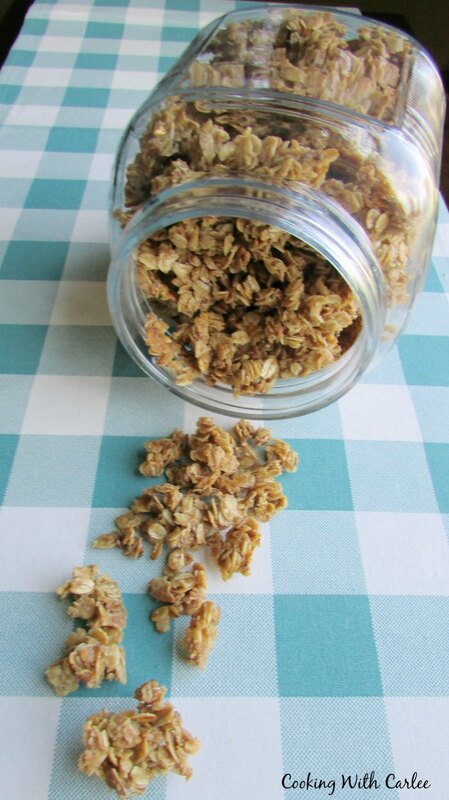 Homemade granola is so much cheaper than store bought and tastier too! Besides it is so easy and customizable. This version is our absolute favorite! Little Dude loves yogurt. He loves smoothies, cups of yogurt and especially fruit and yogurt parfaits. He thinks it is fun to dump some granola on top and crunch on the little bits of sweet goodness. But granola can be expensive, and who knows what they put in it? So I never keep it on hand. I do always have oatmeal though. I also always have some form of sugar and oil. So, I am always just a bit of time and hardly any effort away from granola. There are many variations you can make, but this is our favorite so far! Little Dude has a new found affinity for cereal, and will eat it in a bowl with milk sometimes. He also likes to eat it dry with his hands. But really, he enjoys it most on his yogurt. Throw in some strawberries or a banana and he is set! In the picture above, we layered apple pie filling, vanilla yogurt and granola for my sister's bridal shower brunch. YUM!! Update: This granola is MiMi's new favorite! She stumbled back on it recently, more than a year after I posted it and decided to give it a try. Now she is hooked. She loves that it stays crunchy in spite of our humidity! What are your favorite granola add-ins? Oatmeal is one of our favorite ingredients. We are always putting it in muffins, pancakes and we have quite the collection of baked oatmeal recipes you need to check out. If you like your oatmeal warm, maybe you'd like apple pie steel cut oatmeal. Or if you want an excuse to have chocolate for breakfast, brownie baked oatmeal is a great option. What are your favorite oatmeal recipes? Meanwhile, melt the coconut oil nad stir in the sugar, syrup, cinnamon and salt. Once the oats are toasted, remove from oven and turn the oven down to 250 F.
Stir oats into syrup mixture and spread over the baking sheet again. Bake for one hour, stirring half way through. Remove from oven and spread over wax paper to cool. Break into bite sized pieces and store in an air tight container until ready to use! Hi Carlee, Your recipe looks so good ,healthy, and yummy too! =)Thank you for sharing this. Granola is crazy expensive...I think it was $6 a pound at Whole Foods! I'm with you, homemade is so much better for you! And it really is easy to make! We have been having fun messing around with different combinations of ingredients. This morning Jax had this granola with his peach yogurt and he was as happy as could be. It is! My toddler has been asking for his "nola" when he wakes up! At this rate I'm going to be making granola once a week. Thanks for stopping by! I love homemade granola and this one looks amazing! Thank you so much for linking up at Tasty Tuesday! Your recipe has been pinned to the Tasty Tuesday Pinterest board! Please join us again this week! Thanks! I need to make another batch. We have been flying through it! Made this again today. Love this recipe! Yay! I'm glad you like it so much! I haven't made granola in ages, I should get a batch going again! I love to add Craisins to granola. I go through phases where I make it a ton and then I forget to. Now I really want a batch with craisins!! I always make my own, too, and this sounds lovely. Cinnamon is so good for you. I do like to add dried berries or dried fruit, but that can be hard for little ones to manage. I love fruit and nuts in mine as well, but the dried fruit can get a bit chewy for little dude. We have been loving how affordable fresh blueberries have been lately. I think we've eaten our weight in berries, yogurt and granola! 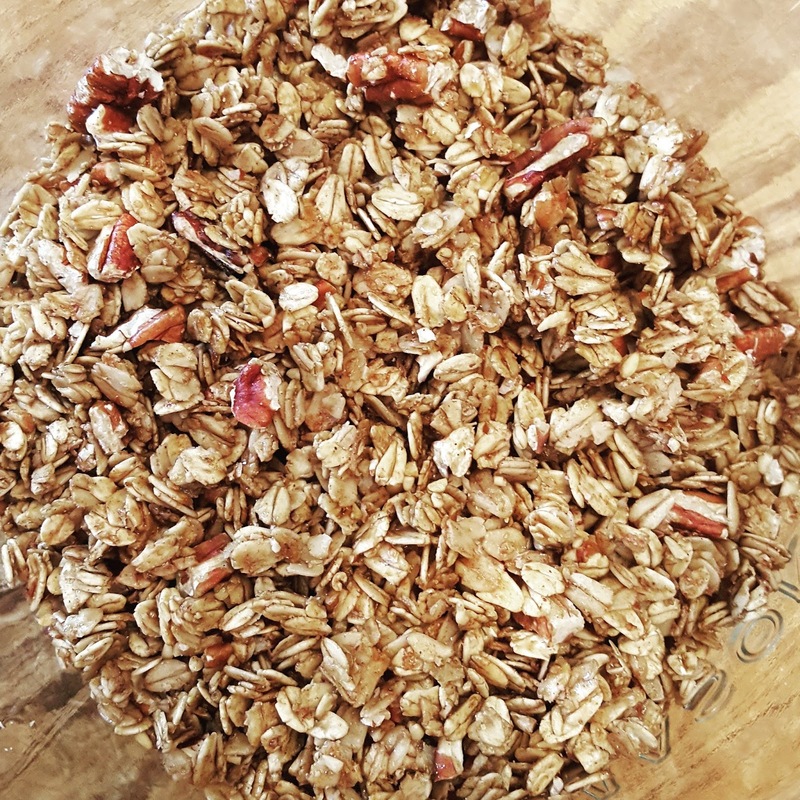 I was hoping you would share the recipe with this granola! I love a good yogurt parfait, my boys have always loved yogurt too, so happy that Jax loves it, he sure has the best mama chef in the house! This is our favorite granola recipe and it is easily tweaked a bit if you want. Thanks as always, Andrea! I'll be there with bells on! Thanks, Miz Helen! I like checking out different granola recipes. Btw, I've made your pumpkin cinnamon roll twice now! I was enjoying trying different ones for a while too, but now I am stuck on this one. I am sure I'll branch out one of these days. And thank you for letting me know!! I haven't made a pumpkin cinnamon roll in a while, and now I want one!! Hi Carlee, I'm going to have to come and stay with you. I can be food taster! 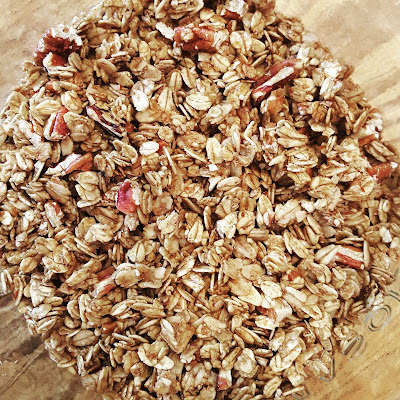 I've never made granola before, I always thought it was fiddly to make, but your recipe is soooo simple! It really is so simple. Definitely come for a visit and taste your heart out! 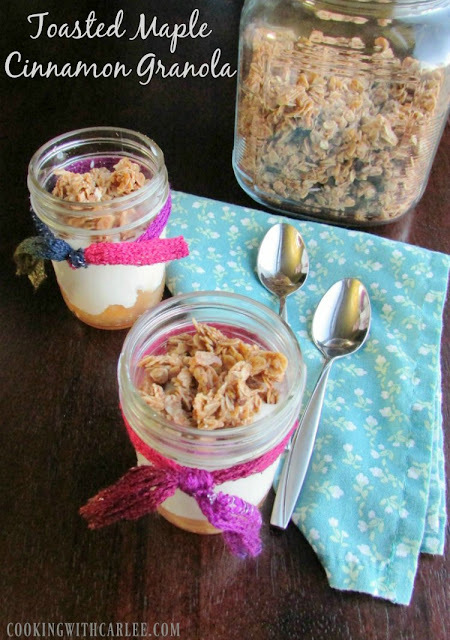 That's one of the best parts about granola, it is so easy to tweak and customize!